…For up to three weeks, at time of this writing. Google WiFi is a mesh-based wireless router that uses multiple access-points to create a wider, stronger signal that’s more tolerant to wireless interference that’s common in a household. In addition, the router automatically configures to join the least congested channel, the fastest wireless band (2.4 or 5GHz, based on your distance from the router), automatically hands your connection off seamlessly from point to point, can be managed via your smartphone. Google’s really gone all out to make setting up a network as fool-proof as possible; I feel it should be noted, though that if for some reason you need a wired connection, you’ll need to purchase a switch or two with this router – Google’s baby really focuses on wireless networks, with only one outbound Ethernet port. Much understated. So purdy. Wow. These access-points are sold in packs of one ($129, ideal for up to a 1500 square foot home), or three ($300, up 4000 square feet), meaning you shouldn’t have a problem picking out a pack that works for your home. Unfortunately, these are in high demand at the moment and in typical Google fashion, they underestimated rather than overproduced – and wait times are between two and three weeks before shipping. 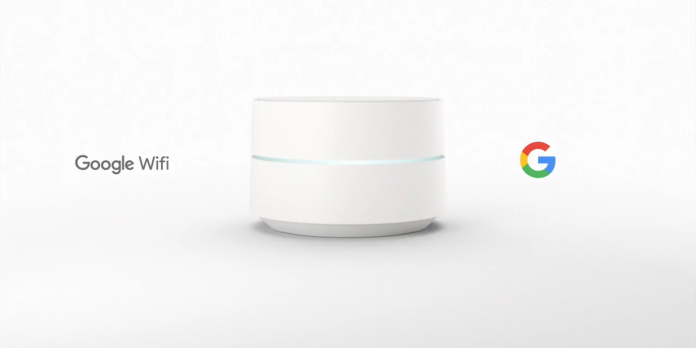 Google WiFi, available for purchase now.